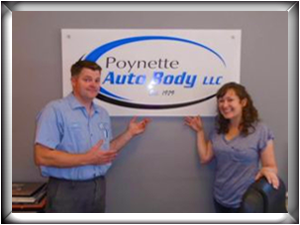 The Poynette Auto Body Team strives to make our shop THE PLACE for autobody collision repairs. From the moment you walk through our door, you are valuable to us. When you drop off your vehicle for repair, your keys are tagged with your last name. You’re not a number to us. The office staff is ready to listen to your story and guide you through the repair process. All you have to do is drop off and pick up your vehicle. We will see that everything else happens in between. The collision repair staff will work diligently so that when you drive away, it will be as if nothing ever happened to your vehicle. We could spend a lot of money on advertising, but we believe word-of-mouth is golden. Just like our customers. So let us take care of you.